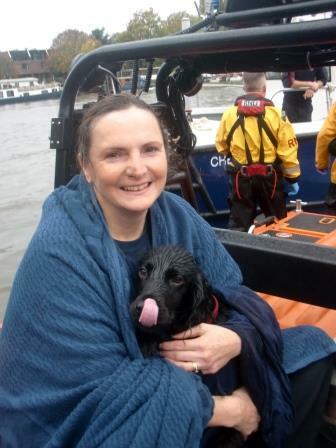 A panicked dog walker who fell into the Thames while trying to rescue her beloved spaniel, had to be pulled out of the water by a passing Port of London Authority (PLA) crew. The 54-year-old woman slipped into the water near Kew Bridge, Kew, this morning (Friday, 6 November). Her cocker spaniel Sasha had somehow been knocked into the river by another dog and Sasha’s frantic owner fell in too as she tried to coax Sasha out. Luckily, an eyewitness alerted the Coastguard and the PLA’s launch Tyburn, which was nearby and crew members were able to help the woman, from Richmond, out of the water. When the PLA team arrived on the scene the woman was up to her chest in water and holding onto the chains along the river bank, trying to keep from being swept away. Joe Darby, one of the three members of the PLA team on the Tyburn, which pulled the woman out said: “The woman appeared cold and a bit shocked when we arrived. The uninjured woman was transferred to a Chiswick RNLI Lifeboat to be looked after. She expressed her surprise at the strength of the tidal river and just how cold it was.